Another wonderful read for the snow-bound flutists at Christmas-time. Tromlitz's words about the flute and flute playing are still ringing true today. And I must say, I find his introductory words about "Do you *really* want to be a Virtuoso??!" to be especially hilarious! 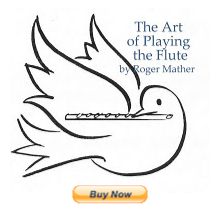 Read Tromlitz's book The Virtuoso Flute-player here. Can you believe that when these words were written it was 1790?? So little has changed about flutists.